COMPARATIVELY little had been heard of the Hungarian aeroplane industry until a short time before the outbreak of war, when, at the Aspern flying meeting, the Hungarian Lloyd firm leaped into prominence by the excellent performance of their new biplane. The first machine turned out by the Hungarian Lloyd Aeroplane and Motor Company, Ltd., of Aszod, Budapest, which was, by the way, built under licence from the German D.F.W. firm of Leipzig, was not finished until just before the Aspern meeting, being, in fact, put through her trial flights on the morning of June 21st, the first day of the meeting. The same evening Lieut. Bier, who will be remembered as the pilot of the Etrich monoplane in the first Circuit of Britain, and who is, or, at any rate, was, before the war, managing director of the Lloyd firm, took the machine up to an altitude of 4,120 metres with two passengers. This performance beat the record of 3,580 metres set up by Lieut, von Blaschke. On June 25th, he bettered Linnekogel's record for pilot and one passenger by reaching a height of 5,600 metres, and two days later improved his own record, pilot and one passenger, by 570 metres, and raised the record for pilot and two passengers to 4,440 metres. These performances came as a surprise to many, as the large biplane gave an impression of being rather heavy, almost clumsy, in fact. This impression, however, was not justified, as the weight empty of the Lloyd biplane is about 1,500 lbs., which cannot be considered unduly heavy in proportion to the size of the machine. 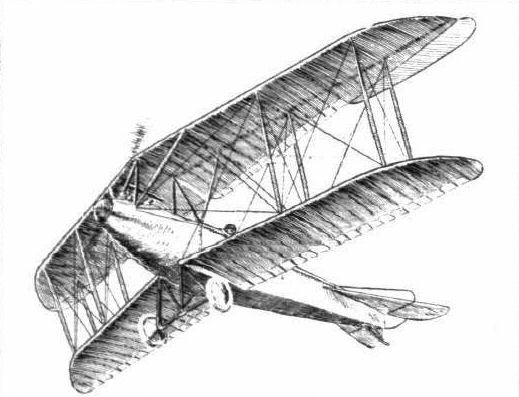 Being built under licence, it is only natural that the Lloyd biplane should follow closely the lines of its German prototype the D.F.W. biplane, of which latter various types have been described from time to time in FLIGHT. From an inspection of the accompanying illustrations it will be seen that the Lloyd model belongs to the "Pfeil" or arrow type, having its wings set at a backward slope of 8 degrees. In plan form the lower and upper planes differ considerably, the upper plane having a nearly straight trailing edge, whilst that of the lower plane is almost parallel to the leading edge. This arrangement would seem to be open to criticism from a constructional point of view, owing to the great amount of overhang of the inner portion of the trailing edge of the upper plane. In addition to their rearward slope, the wings are staggered considerably in relation to one another, the upper one being about 2 ft. 6 ins. farther forward than the lower one. The top plane, which is divided in the centre, is attached to a steel tube cabane resting on the upper longitudinals of the body, whilst the two halves of the lower plane are attached to the sides of the fuselage. Two pairs of streamline struts connect the planes on each side of the body, and a peculiarity in the strutting is to be seen in the inner inter-plane struts, which do not, as is usually clone, run from upper to lower main plane, but from the spars of the top plane to the upper longitudinals of the body. Lateral control is by means of slightly upturned ailerons hinged to the top plane only. The. fuselage, which is of rectangular section, is built up entirely of seamless steel tubes, oxy-acetylene welded. In the front portion it is covered with aluminium, and a turtle back of the same metal tops the body, while the rest of the fuselage is enclosed in a fabric covering. The engine - a 140 h.p. Hiero - is mounted on stout ash bearers, and is almost totally enclosed in the aluminium covering, which is at this point given a very good streamline form. The seats for pilot and observer are, as always in the arrow type of biplanes, placed comparatively far back in the fuselage, the pilot occupying the rear seat, where he is able to look straight down behind the trailing edge of the lower plane. The observer, on the other hand, is situated sufficiently far forward to look over the leading edge of the lower plane, although not far enough forward to be able to drop bombs over the edge of the plane. For bomb-dropping a special apparatus is fitted inside the fuselage. As in the D.F.W., the seating arrangement of the Lloyd biplane is most comfortable, and very complete instrument sets are fitted. The controls are of the usual type demanded by the German and Austro-Hungarian Governments, and consist of a rotatable hand wheel for warp and elevator and a foot bar for the rudder. The under-carriage is of the simple "W" type, and is made of streamline steel tubes. The two halves of the divided axle are hinged to the apex of the inner chassis struts, and are sprung by rubber bands from the outer members of the chassis. Disc wheels are fitted in order to reduce head resistance. The tail planes consist of a triangular fixed plane, to which is hinged the divided elevator, and of a small vertical fin, to which is hinged the rudder. The speed range is from 35 to 80 m.p.h., and the machine has climbed the first 2,000 metres in 10 minutes. Lloyd LS 1 - also designated as Lloyd 40.01. 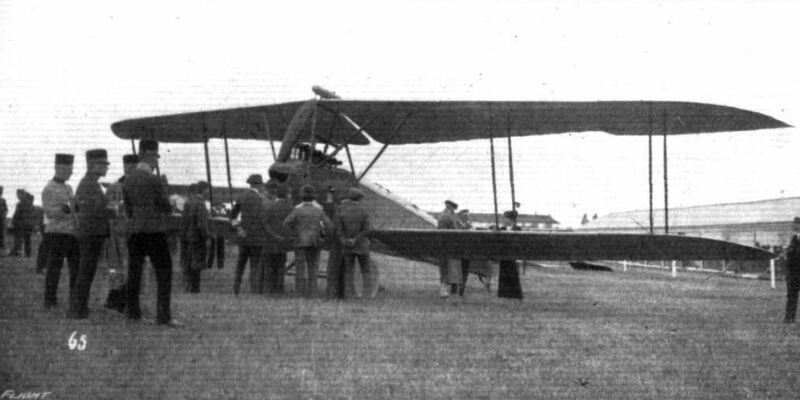 The "20" was its competition number at the 3rd International Flugmeeting at Aspern in June, 1914. 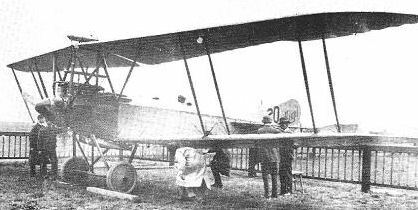 Little valid information survives on this Austrian Army Air Service-operated Lloyd C I of early 1914 design origins, other than that it was powered by a l20hp Austro-Daimler and that it set a new altitude record of 21,709 feet on 27 June 1914. Only built in small numbers, the type led to the Lloyd C II through C V series, the workhorses of both the reconnaissance and training units of the Austro-Hungarian Air Service; reconnaissance, in the early years, being the only real function of military aircraft. 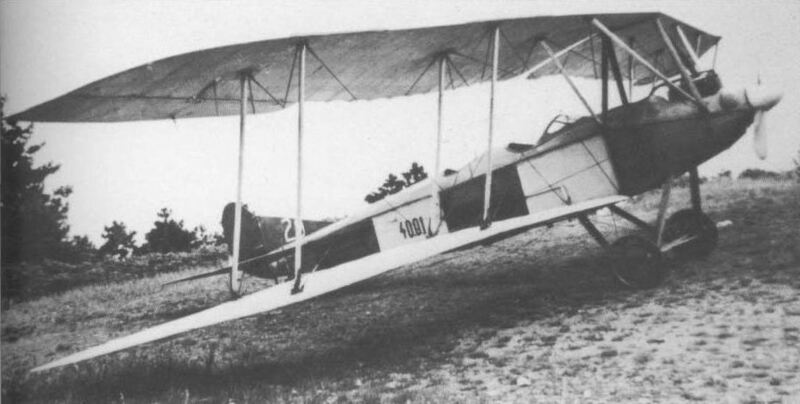 Three-quarter front view of the Lloyd biplane. 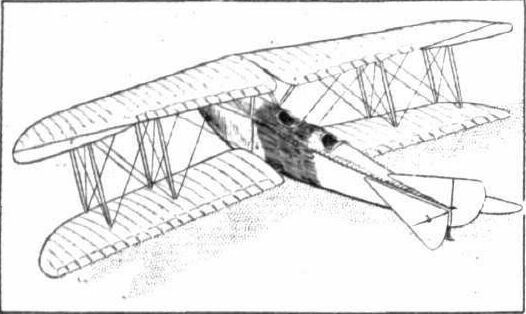 Three-quarter rear view, from above, of the Lloyd biplane. The Lloyd biplane as seen from below. 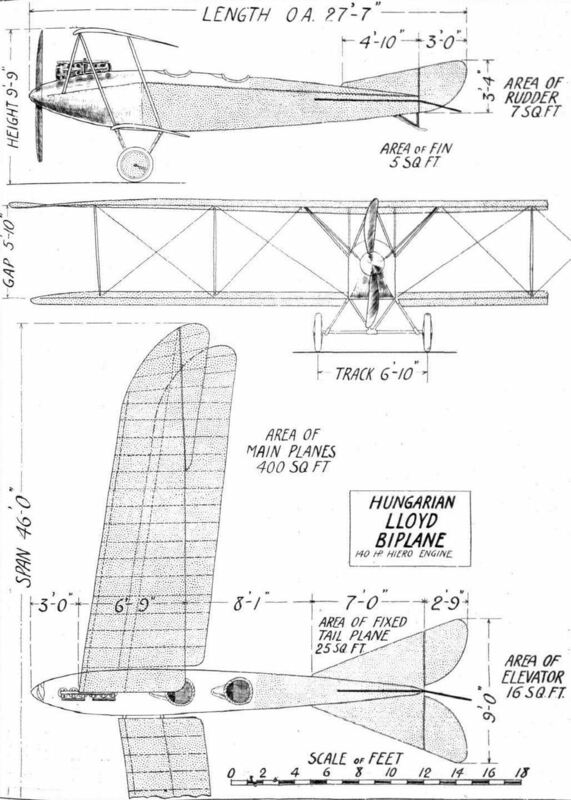 Plan, front and side elevation to scale of the Lloyd biplane.